When Fiedler published his “A note on Companion matrices” in 2003 on Linear Algebra and its Applications, he could not have foreseen the significance of this elegant factorization of a companion matrix into essentially two-by-two Gaussian transformations, which we will name (scalar) elementary Fiedler factors. Since then, researchers extended these results and studied the various resulting linearizations, the stability of Fiedler companion matrices, factorizations of block companion matrices, Fiedler pencils, and even looked at extensions to non-monomial bases. In this chapter, we introduce a new way to factor block Fiedler companion matrices into the product of scalar elementary Fiedler factors. We use this theory to prove that, e.g. a block (Fiedler) companion matrix can always be written as the product of several scalar (Fiedler) companion matrices. We demonstrate that this factorization in terms of elementary Fiedler factors can be used to construct new linearizations. Some linearizations have notable properties, such as low bandwidth, or allow for factoring the coefficient matrices into unitary-plus-low-rank matrices. Moreover, we will provide bounds on the low-rank parts of the resulting unitary-plus-low-rank decomposition. To present these results in an easy-to-understand manner, we rely on the flow-graph representation for Fiedler matrices recently proposed by Del Corso and Poloni in Linear Algebra and its Applications, 2017. 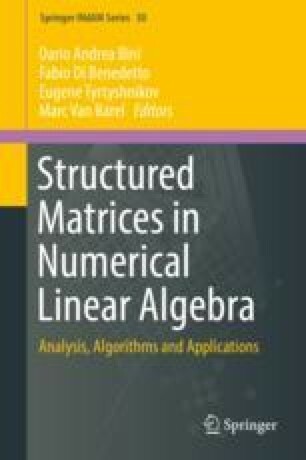 The research of the first three authors was partially supported by GNCS projects “Metodi numerici avanzati per equazioni e funzioni di matrici con struttura” and “Tecniche innovative per problemi di algebra lineare”; the research of the first two was also supported by University of Pisa under the grant PRA-2017-05. The research of the fourth author was supported by the Research Council KU Leuven, project C14/16/056 (Inverse-free Rational Krylov Methods: Theory and Applications).